As S.S.L. Chart Soccer was my first foray into the world of dice soccer games, I have decided to create this page to show how I run this particular game now. It has come a long way since the blue and red monopoly dice and the scribbled notes, most of which my dad threw away, and nowadays I use Google Sheets to play the game, which is a lot easier and is less prone to losing precious records. On these pages I will attempt to show how it is done, and who knows, maybe it will inspire others to create their own versions of the game. As a technology geek, even the act of creating the games is fun. As mentioned above, I have used Google Sheets to create the game. I originally used Microsoft Excel, but as I use Google services a lot I decided to port it to Google Sheets. This means that the game is easily accessible from anywhere and on almost any device. It is also easier to use than Excel and of course it is a free service. Note that each club has a "Class" code. 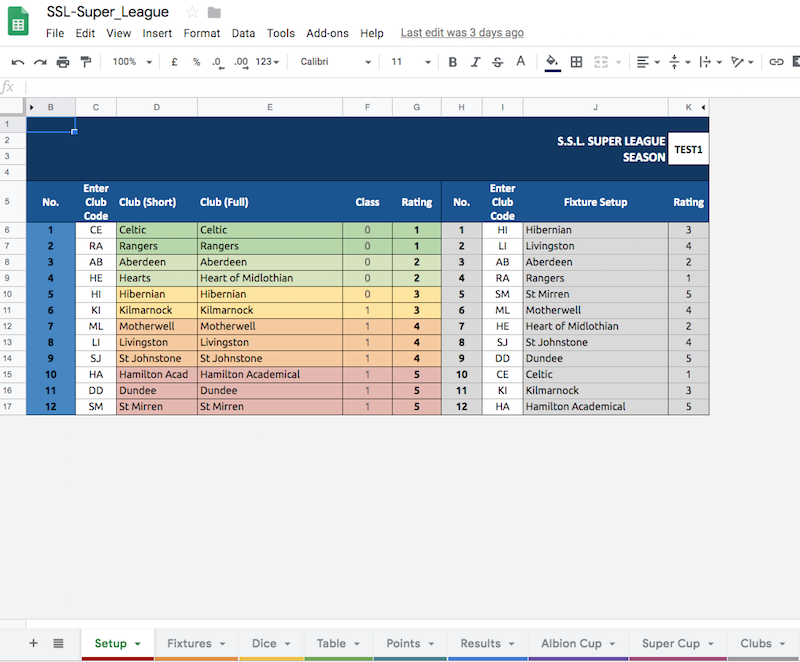 I use this to classify teams according to their real-life league position to ensure that ratings reflect reality, which is especially crucial in the Scottish league being as it is dominated by two clubs. The top class, which is '0', actually comprises five clubs at present because I want it to be a little more competitive than the real-life version. Currently, these clubs are: Aberdeen, Celtic, Hearts, Hibernian and Rangers (Dundee United were demoted form this group when they were relegated to the SPFL Championship). Below this, clubs are classed according to the real-life division they are currently in, e.g. '1' for the Premiership, '2' for the Championship etc. 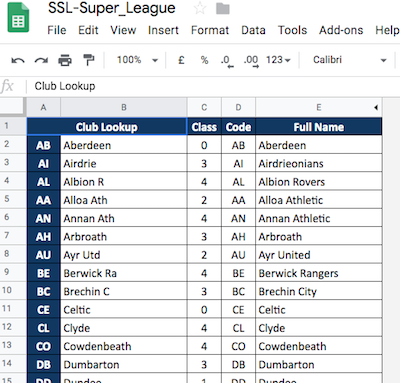 This class code appears in the ratings list on the "Setup" screen, and clubs are rated by class first and league position second. 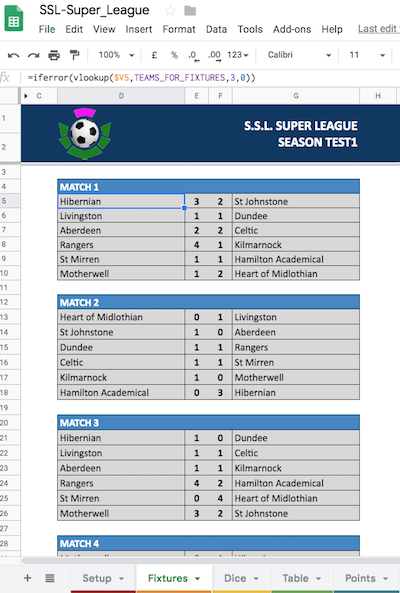 Having entered the teams on the "Setup" screen, the fixture list is populated on the "Fixtures" tab.